Getting the Love You Want is a great book on how childhood wounds influence our relationships. It has lots of practical exercises to heal childhood wounds and improve our relationships. Above everything, we seek connection, says Harville Hendrix. And what brings most couples to therapy is a lack of connection both between them and the world around. Their relationships are more of a “me VS you” than “us” (also read: how to fix combative relationships). And the reasons why they fail at connecting, says the author, is because of their childhood. Children need an attuned parent. Children need a caregiver who is present both physically and emotionally. It’s a caregiver who soothes you and takes care of you. An attuned parent also encourages the baby to express all emotions by accepting them. “are you angry, do you want to stop playing”? Attuned parents raise children who are more likely to create solid and satisfying relationships as adults. They are not attracted to people who abuse them and attract good mates with ease because they have a positive self image (read how low self esteem gives you abusive relationships). My note: Harvilly is basically describing a secure attachment type. The author says most children suffer both wounds as many family tend to have a neglecting parent and an intrusive one. By connecting with our partners deeply we fix our children’s wounds heal. It’s because our unconscious mind doesn’t differentiate between present and past. Hence building a strong connection with our partners both improves our relationships and fixes our old wounds. Important note: you cannot connect if there’s lots of negativity in the relationships (also read the four horsemen that destroy relationships). The author explains why we are attracted to certain people and summarizes the theories. We pick mates that enhance the chances of offspring survival. Men go for beauty and fertility (young age) and women go for alpha qualities (also read The Selfish Gene and The Moral Animal). Social psychology postulates we pick mates that are more or less our equal (also read The Social Exchange Rule). How a potential mate enhances our own self esteem (also read how to have perennial high self esteem). The theory Harville Hendrix add is that of the unconscious mind pulling us towards mates that resemble out caregivers. It’s something he sees over and over in therapy. The author says that we seek mates who are similar to our caregivers to heal child wounds. Our old brains believes we have finally found the ideal candidate to make for the psychological damage of our childhood. Indeed we look both for positive and negative traits from our parents, but the negative traits are far more influential. Parents who push children away raise children with an insatiable need for closeness (anxious) and parents who smother their children and never let them explore raise children who crave personal space (avoidants). My Note: the theory makes sense… In theory. I am an avoidant and my parents gave me all the freedom in the world. Children will invariably get the message that some of their behavior are not OK, which makes them feel like they are not accepted as a whole. The parts that are not accepted become our “lost self”. And we often project the traits of our lost self that we denied into our partner. For example, we might project our repress anger on our partner and feel that they are angry persons. The author says the mistake many parents do is to ignore or disapprove of a baby’s feeling. He proposes instead that a parent always validates the child’s feelings, even when they disagree. For example they could say “I can see you are mad, and you don’t want to do what I ask. But I’m the parent and you need to do what I say”. To feel whole again we often look for complementary traits in our mates. At a certain point romantic love ends and the power struggle begins. The author says that once the relationship is secure a switch happens and we activate all the latent infantile wounds. We find that those complementary personality traits annoy us, and the traits of our lost self that we longed for now wound us. The same way our parents hurt us when they neglected or repressed them. Only a minority of couples manages to overcome the power struggle phase. The author says that the secret is to satisfy each other’s childhood longings. The conscious partnership is all about fixing each other’s problems. The book has lot of exercises. If you feel this is an issue you have in your relationship, then I recommend you grab a copy. I particularly liked a central tenet, which is that to be loved, we must first love. The author proposes a different approach to criticism in relationships. Criticism indeed often tells as much about the criticized partner as it says about ourselves, which is what we should explore more. Don’t get me wrong, “Freudian” is not offensive: Freud was a genius. But he also jumped to many unscientific conclusions that proved to be wrong. And it’s that jumping to conclusions that I don’t like. For example, the author says that we look for complementary traits in our partners so that we can feel whole again. That could be the case. But what if we want complementary traits to enhance our chances of survival and producing more competent offspring? It could be reductive in my opinion to explain relationships only, or even mostly, through the prism of childhood. I disagree with the idea you can create a comprehensive theory by looking at the experience of a therapist’s experience, no matter how long or big the reference population. It’s because people who go to therapy are inherently self-selecting for people with issues and recurring patterns of issues. 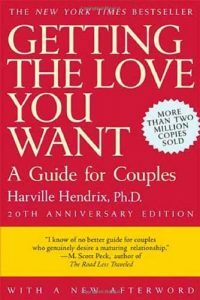 Hendrix end up talking of avoidant, anxious and secure attachment types quite a bit but never mentions the theory. And calls them in different ways such as “fusers” and “isolators”. I found that strange as this book is basically an explanation of how attachment styles develop. If you’re interested, also check out the book Attached. In my opinion this book is perfect for those who had childhood traumas or neglecting parents. It might be a bit too specific for the large population. Getting the Love You Want will give you a deeper understanding of the subconscious elements that influence relationships. I listed a lot of cons, but that doesn’t change the fact taht Getting the Love You Want opened new major doors of understanding for me. And I’m very grateful for it. Getting the Love You Want is an amazing book with lots of deep insights and great exercises to help couples. It’s a must read to understand relationships and human behavior. Somehow, this is the only “must read book” I give 4 stars to. And it’s because I like to keep the 5 stars for foundation books. And Getting the Love You Want is very “specific”. Such as, if you’re trying to improve your relationship, I believe you should not start with this book. But first go for more generally applicable resources and only after possibly plunging into unconscious and child-problem fixing.